A new game has been spawned by the collective. I’ve been a bit quiet here lately, Intrepid’s out, doing well and doesn’t have any news to speak of, while London 2051 has been stuck in a creative rut it’s only now starting to climb out of. So rather than that I thought I’d write about is another project of mine ‘Athesia Reborn’ a game ran twice annually for the Essex University Roleplay Game Society. It’s been running for 7 years, usually hosts ~25 players, lasts from Friday evening to Sunday afternoon and has recently transitioned from using D&D 4E to a system of our own devising. My game is called War Stories for now. Only because I can’t think of anything that alliterates with Sten guns. It’s a straight ahead WW2 game, with the rather unique twist in that it contains absolutely no zombies at all. The central conceit is this. D&D came from Chainmail, a fantasy miniatures wargame. D&D is (still) essentially a wargame at it’s heart, but with all the cool RP stuff layered on top of that. It has people who fight, people who are skilled, people who support, and people who control the situation. 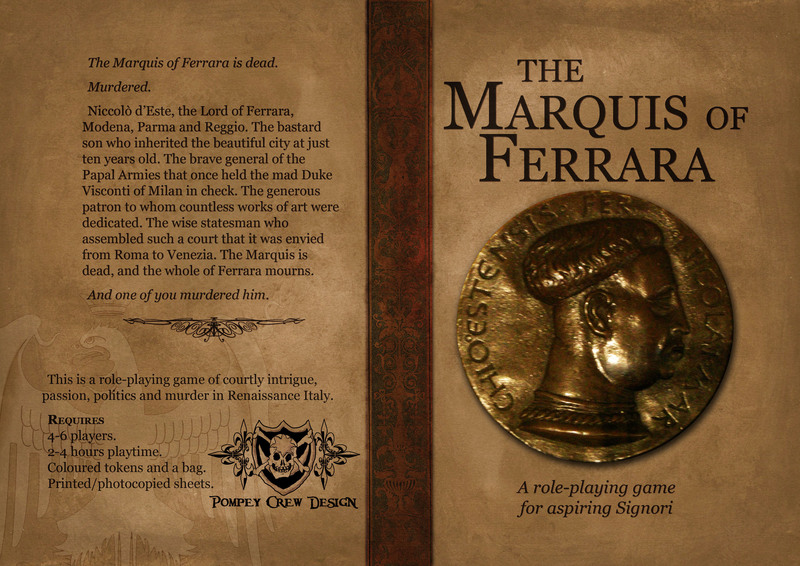 A few years ago, I ran a fantasy game set in a vast city. Well, not just in a vast city; there was dimension hopping and time travel and navigating heavenly bodies. But I started with the ambition of telling the story of the city. I’d been subsisting on a literary diet of Warren Ellis’ Transmetropolitan and M John Harrison’s Viriconium and naturally I’d read Gormenghast and others. The system was terribly generic, at least to start with, and I was never truly satisfied. I went through at least one complete shift to a different system (originally BRP, then some kind of Storyteller variant). I doubt the players minded nearly as much as I did. Looking back the system did a few things right but it was a terrible muddle. Years later I came up with a tool I called the City Accelerator, which was the best name I could come up with at short notice. It’s the tool I would have used to map the city, if I’d thought of it at the right time. Since I didn’t, I decided to turn it into its own game. The game isn’t about that city, it’s about any city where people are living anonymously, cheek-by-jowl. The City Accelerator is just one component; people will be another, and character a third. More to follow, TTFN. So there this game I’ve been working on. 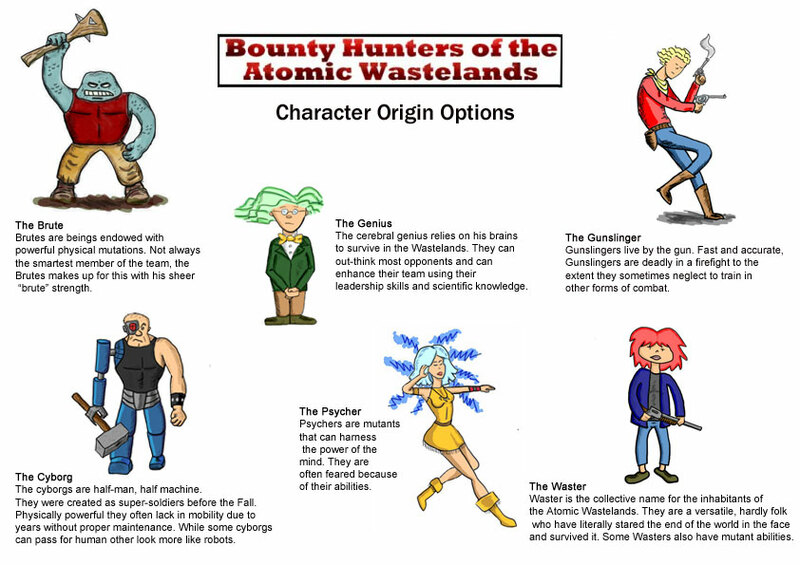 I call it Bounty Hunters of the Atomic Wastelands. It’s about about bounty hunters in a post-apocalyptic atomic wasteland. It’s a Fate based game, just a much dumbed down version of Fate because that’s how we do things in the Atomic Wastelands. But as a picture is worth 1000 words, or in my case 250 words tops, I’ll let the images do the talking.